APR is pleased to present the ultimate transmission control unit (TCU) upgrade for the DL501 Gen 1, Gen 1.5 and Gen 2 S Tronic transmissions! APR’s TCU upgrade is available for 3.0 TFSI platform vehicles and is conveniently flashed to the vehicle’s TCU through the OBD-II port with user definable options selectable at the time of install. 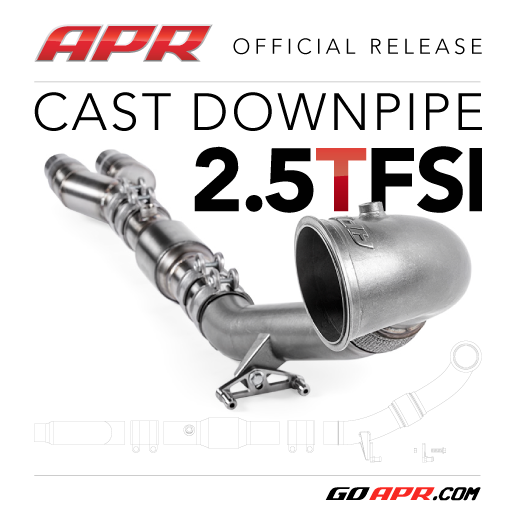 APR Presents the 2.5 TFSI Cast Downpipe Exhaust System! APR is pleased to present the ultimate Cast Downpipe Exhaust System for the 2.5 TFSI MKII TT RS & RS3 all wheel drive platform! You are currently browsing the APR_UK_news blog archives for May, 2015.